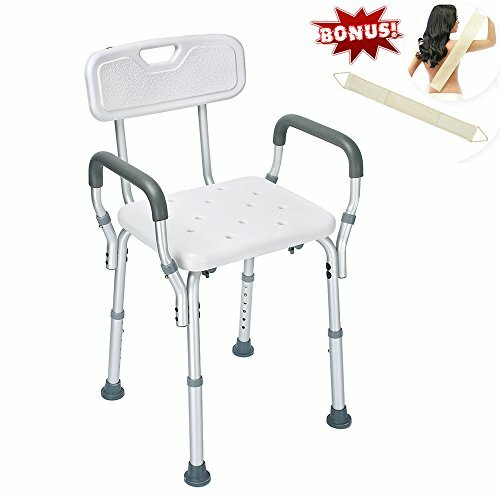 Healthline Product Adjustable Shower Bench Bath Chair is CE, FDA certificated top quality product, always offers a comfortable and safe solution to any fall-risk individuals or seniors who have problems standing while showering, especially suitable for the old man and pregnant women.Create a relaxing shower experience. Constructed of strong anodized aluminium frame with angled legs and non skid rubber tips, our shower chair is both sturdy and durable. Its wide, contoured anti-bacterial PE seat offers good support and hygiene for individual during use. The drainage holes on the seat is designed to allow water to be drained effectively thereby reducing the risk of slipping. Our tool-free assembly also makes it easy for anyone in the family to assemble for use within minutes. Versatile by remove back support and padded armrests, to make it a shower bath stool. Seat Height with Backrest: 29" - 34"
Seat Height to Ground: 15" - 20"
FDA, CE CERTIFICATED: Germany-imported, advanced machinery and production process ensures both comfort and safety. SECURE, DURABLE & ENVIRONMENTAL FRIENDLY: made of heavy-duty anodized aluminum frame, recyclable and degradable HDPE seat (13"D x 16"W) and backrest, weights 8.5 lbs (with back support), with weight capacity of 300lbs. TOOL-FREE ASSEMBLY: easily assembles in minutes. Tool-free removal of legs, armrests, and backrest make storage and travel easy and convenient. VERSATILE & EASY TO USE: removable back support and padded armrests with height adjustable (15"-20") legs allow users to customize chair based on specific preferences. ONE MORE INNER GIFT BOX, 100% AUTHENTICITY GUARANTEE: 30 days free money back guarantee, 60-day unconditional return policy and 3-year limited warranty.